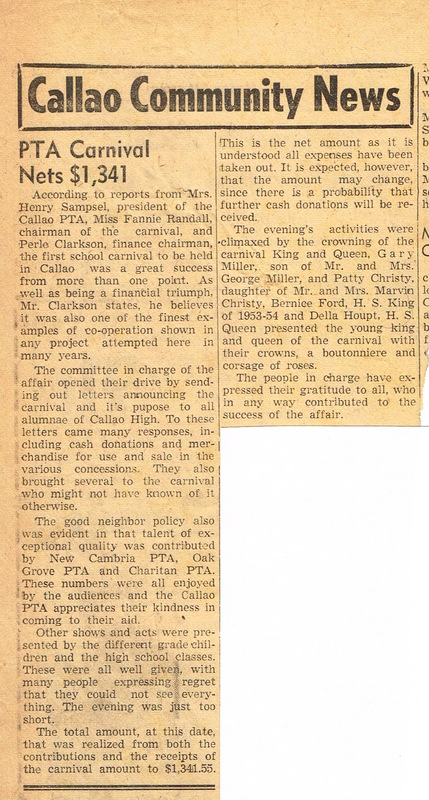 On this day, 62 years ago, an article appeared in the local paper about the PTA Carnival that the Callao School held on March 5, 1954. Carnival tonite. We girls (t.v. girls) gave two hula shows & sang Aloha in the Jr. side show. They made over $400. Dale was there & he brought me home. Patty C & Gary Miller were crowned. It was all real good. This was the first carnival held in the new school gymnasium, which had just been finished and dedicated a few months earlier. Hazel served on the committee, and attended several meetings for the planning of the carnival, so I’m sure she was glad that it all went well and made them some money. And evidently, they hadn’t counted all the money just yet! According to reports from Mrs. Henry Sampsel, president of the Callao PTA, Miss Fannie Randall, chairman of the carnival, and Perle Clarkson, finance chairman, the first school carnival to be held in Callao was a great success from more than one point. As well as being a financial triumph, Mr. Clarkson states, he believes it was also one of the finest examples of co-operation shown in any project attempted here in many years. The committee in charge of the affair opened their drive by sending out letters announcing the carnival and it’s pupose to all alumnae of Callao High. To these letters came many responses, including cash donations and merchandise for use and sale in the various concessions. They also brought several to the carnival who might not have known of it otherwise. The good neighbor policy also was evident in that talent of exceptional quality was contributed by New Cambria PTA, Oak Grove PTA and Charitan PTA. These numbers were all enjoyed by the audiences and the Callao PTA appreciates their kindness in coming to their aid. Other shows and acts were presented by the different grade children and the high school classes. These were all well given, with many people expressing regret that they could not see everything. The evening was just too short. The total amount, at this date, that was realized from both the contributions and the receipts of the carnival amount to $1,341.55. This is the net amount as it is understood all expenses have been taken out. It is expected, however, that the amount may change, since there is a probability that further cash donations will be received. The evening’s activities were climaxed by the crowning of the carnival King and Queen, Gary Miller, son of Mr. and Mrs. George Miller, and Patty Christy, daughter of Mr. and Mrs. Marvin Christy, Bernice Ford, H. S. King of 1953-54 and Della Houpt, H. S. Queen presented the young king and queen of the carnival with their crowns, a boutonniere and corsage of roses. The people in charge have expressed their gratitude to all, who in any way contributed to the success of the affair. 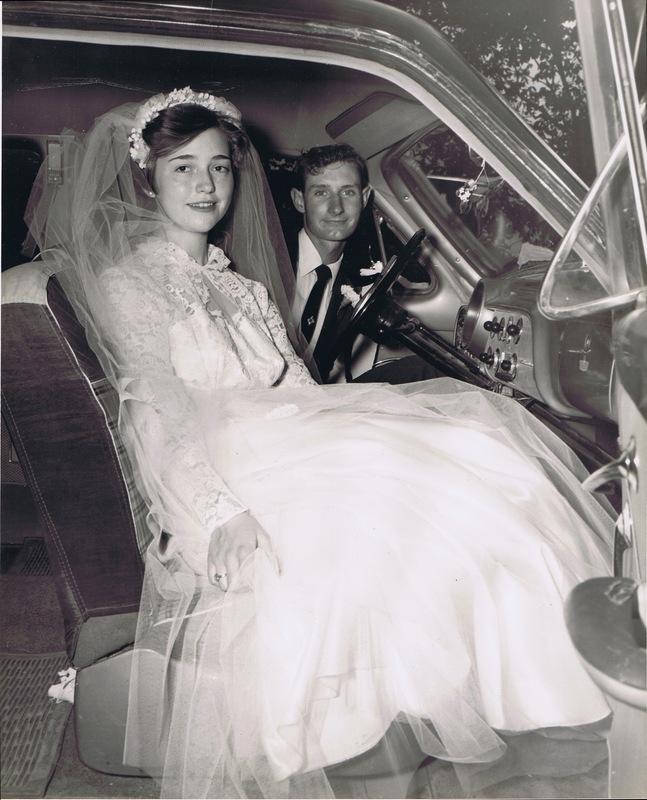 When Dale and Hazel left their wedding reception, they got in the car and headed south for a brief honeymoon. They only went as far as Columbia, Missouri, just over an hour away. 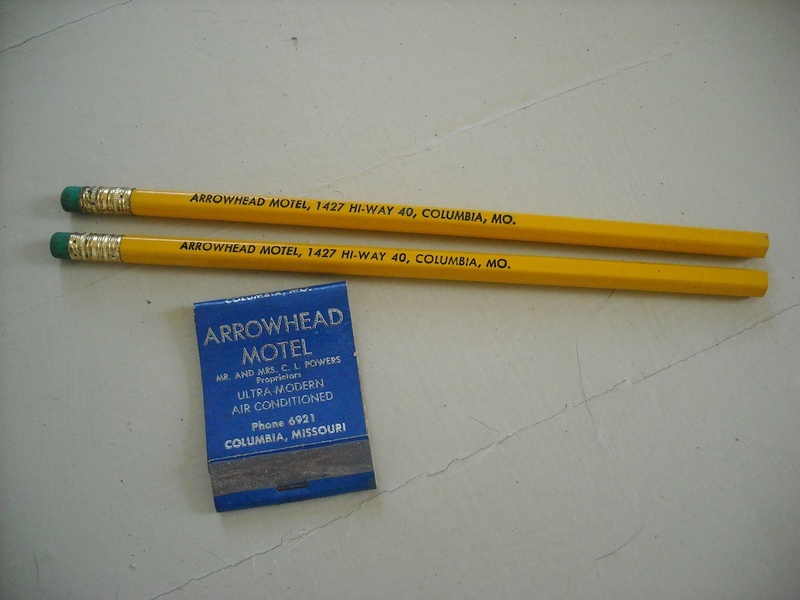 They stayed at the Arrowhead Motel on Hi-Way 40. When they returned home a few days later, they settled into married life together in the little 5-room farmhouse they were renting, not far from Dale’s parents. Dale worked for his father, and a couple other area farmers, and dabbled in some farming of his own, while Hazel, just turned 18 years old, began living her dream of being a farmer’s wife. 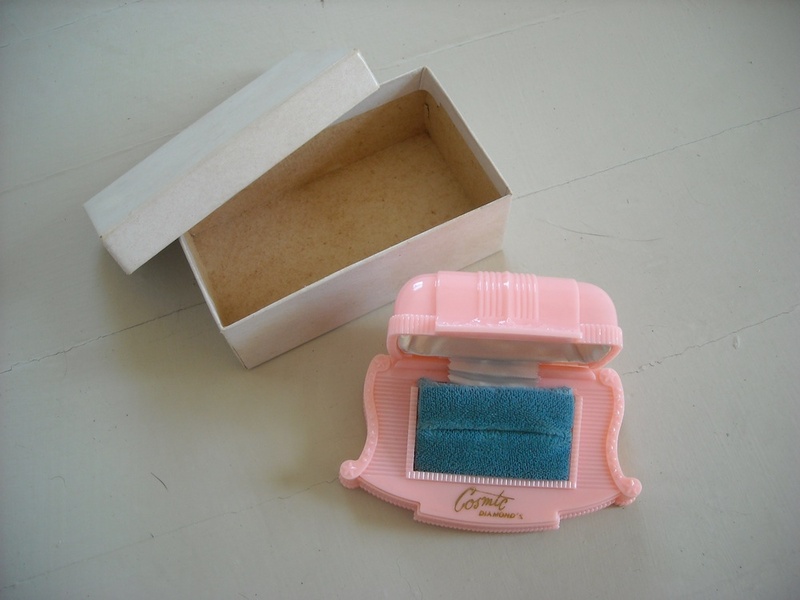 I can hardly believe that we have the actual box that Hazel’s rings came in! I thought we had the receipt, too, but I couldn’t find it, so maybe that was just my imagination. I’m sure we’d be shocked at how little they cost, which probably seemed like a small fortune to Dale at the time! Nineteen years old, working as a farmer, getting ready to take on a wife to support, and wanting to start a family — no pressure there! I don’t know what the rings themselves looked like, other than from Hazel’s crude drawing and description of them from THIS POST. I’ve got one more post planned about the wedding, and then we’ll move on. I know you’re anxious to hear all about what’s coming next, right? Something borrowed, something blue . . .
Hazel followed all the traditional customs of the day when she got married. 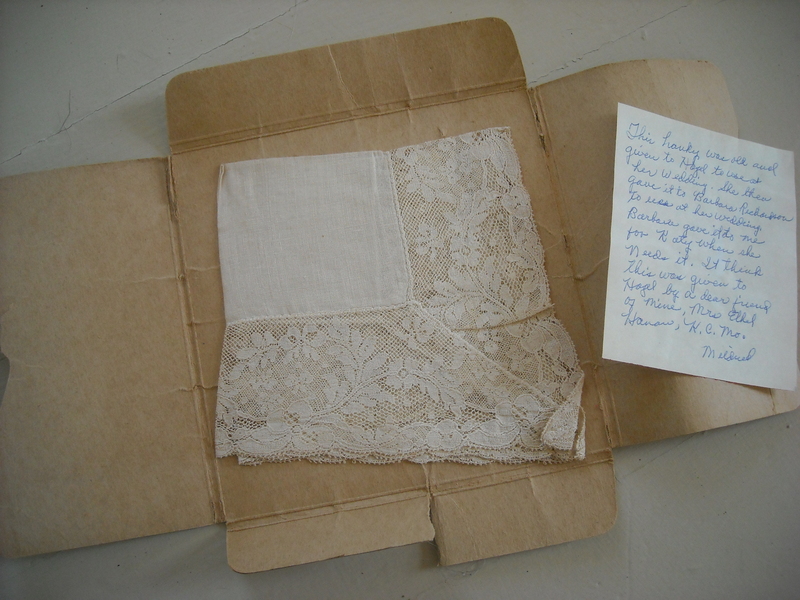 While I’m not completely sure what her “something old” item was, I know her dress was new. 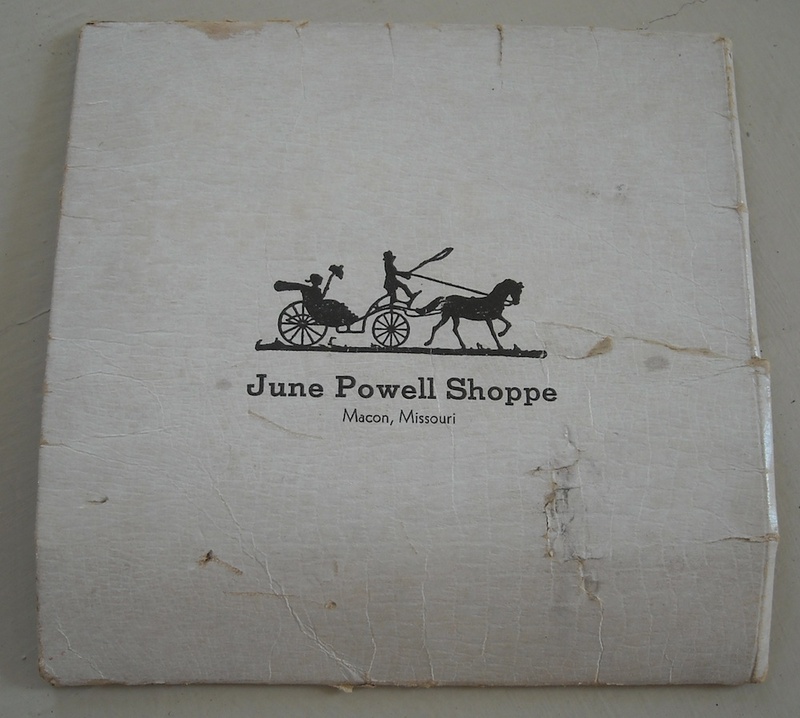 But we also found this box with a handkerchief in it that says it came from the June Powell Shoppe in Macon. 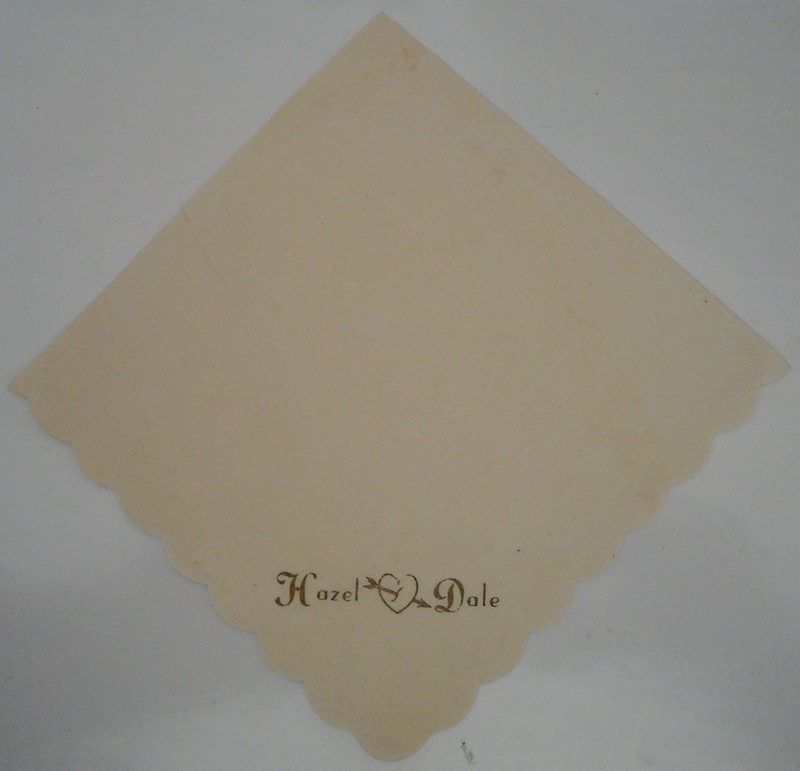 So there’s a little confusion over which hankie came from where, and which one she actually carried. Maybe she carried them both, for her something borrowed and something old. 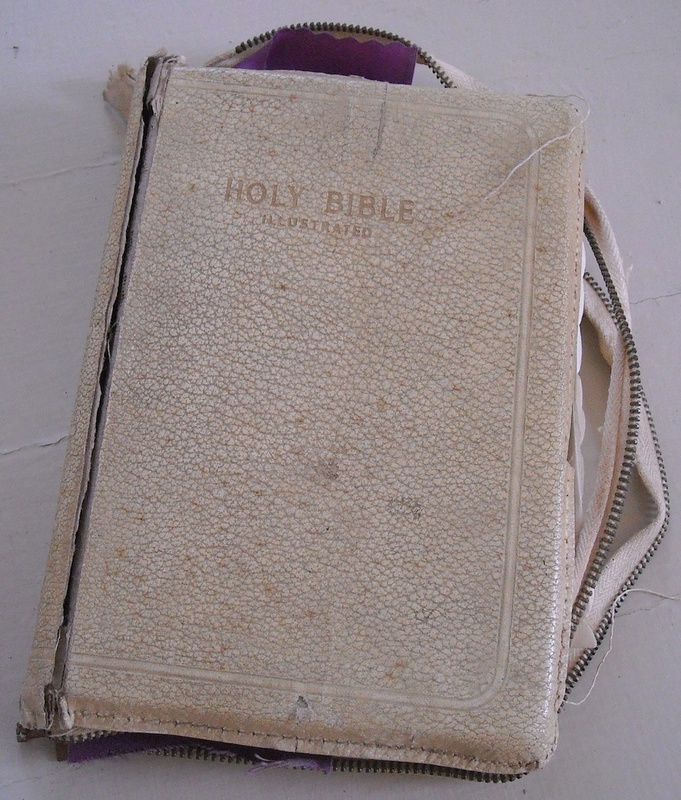 The newspaper article about the wedding states, “She carried a white Bible, topped with a bouquet of white carnations and stephonatis, and a white lace trimmed handkerchief.” After the wedding, this was evidently Hazel’s daily Bible because it’s fairly worn out. Over the next few days, I’ll show you some of the keepsakes my sister and I have from the wedding. 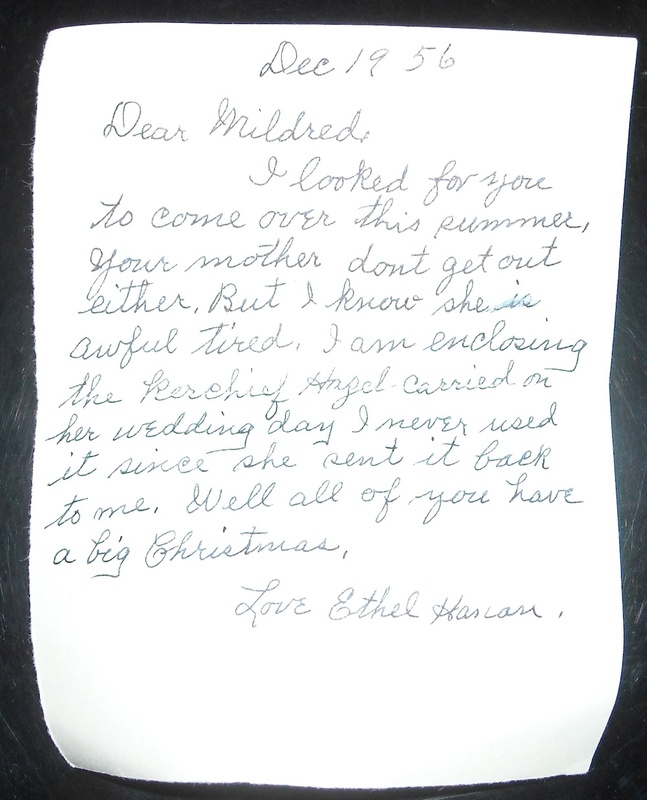 On July 28, 1954, Hazel talks about going to town with her Aunt Ruby to see about things for the wedding. I don’t know what happened to the bride and groom from the cake, but I have several of the napkins from the reception. Their names are printed on in gold foil, and I’m sure the napkins were originally white, but after 61 years, age is showing on them. 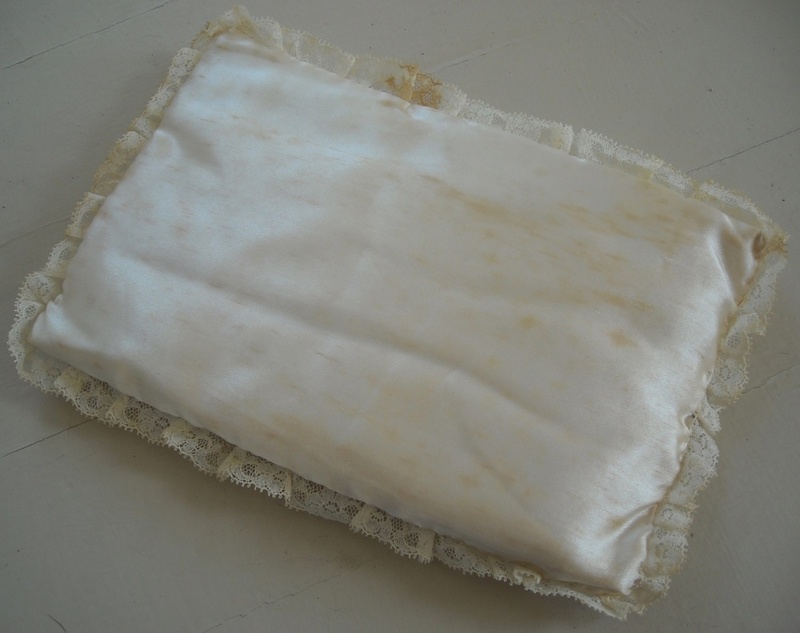 She also mentions buying satin and lace for the ring bearer’s pillow, and she made it herself. It’s very simple — only plain satin and lace. Age is showing on it, too. Sometimes ring bearer pillows have little ties to tie the rings on with so they don’t get lost coming down the aisle, but not this one — so little Jerry had to be extra careful to get all the way down there without losing them. He looks like he was taking his job pretty seriously, and evidently, he never lost the rings! I’m so lucky to have this group shot of everyone in the wedding party. If you click on it, you can see it larger. 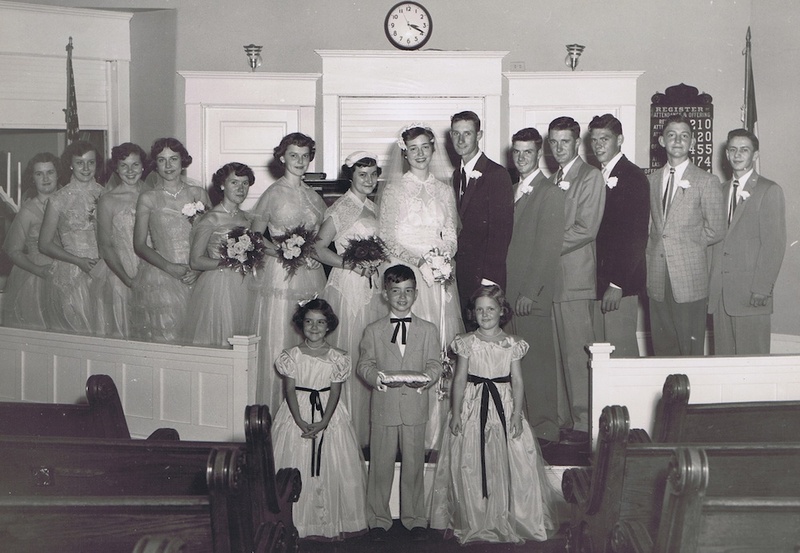 In front, from left to right, is Patti Pagliai (Dale’s little sister), Jerry Lomonaco (the ring bearer), and Beverly House. Jerry and Beverly are Hazel’s little cousins. From left to right in back: Unidentified, Carol Milburn, unidentified, Donna Johnson, Jane Day, Shirley Jones, Judy Anderson, Hazel, Dale, Damon Pagliai, Bob Jones, Leroy Binder, Donald Hyde, and Don Wisdom. There are two unidentified girls in the photo, and while I’m assuming they’re “the two Nancys”, I could be wrong, so hopefully, someone can tell me who they are. Miss Hazel Hyde, of Callao, and Dale Pagliai, of College Mound, were married at 2 p.m. Sunday, Oct. 3, at the Baptist Church at Bevier. The Rev. Lee Lewis, pastor of the church, read the double ring marriage service before the altar decorated with baskets of white mums and white candles in tall candelabra. The bride is the daughter of Mr. and Mrs. Vern Hyde, of Callao, and the bridegroom’s parents are Mr. and Mrs. Rod Pagliai, of College Mound. Mrs. Alan Jones, pianist, played a prelude of nuptial music and the traditional wedding marches. She also accompanied the soloist, Miss Donna Johnson, who sang “Because” and “I Love You Truly” before the ceremony and “The Lord’s Prayer” as the benediction. Miss Johnson wore a orchid net ballerina length dress with a corsage of pink carnations while Mrs. Jones was dressed in navy blue with a red carnation corsage. Miss Nancy Pagliai, gowned in a floor length dress of blue net, and Miss Nancy Christy, in a similar dress of green, lighted the candles. The girls, who are cousins of the bride and bridegroom, wore corsages of pink carnations. The bride chose for her wedding a dress of white net and lace fashioned with long tapered sleeves and buttoned down the back. Her fingertip length veil of net was caught to a flower trimmed head piece. She carried a white Bible, topped with a bouquet of white carnations and stephonatis, and a white lace trimmed handkerchief. Miss Judy Anderson, of Callao, was maid of honor and Miss Jane Day, of Callao, and Miss Shirley Jones, of Bevier, cousin of the bride, were bridesmaids. Miss (gap here — error in paper) tired in floor length dresses of yellow net and lace, while Miss Day wore aqua net. They carried colonial bouquets, Miss Anderson’s nosegay of red roses while the other two carried yellow roses. 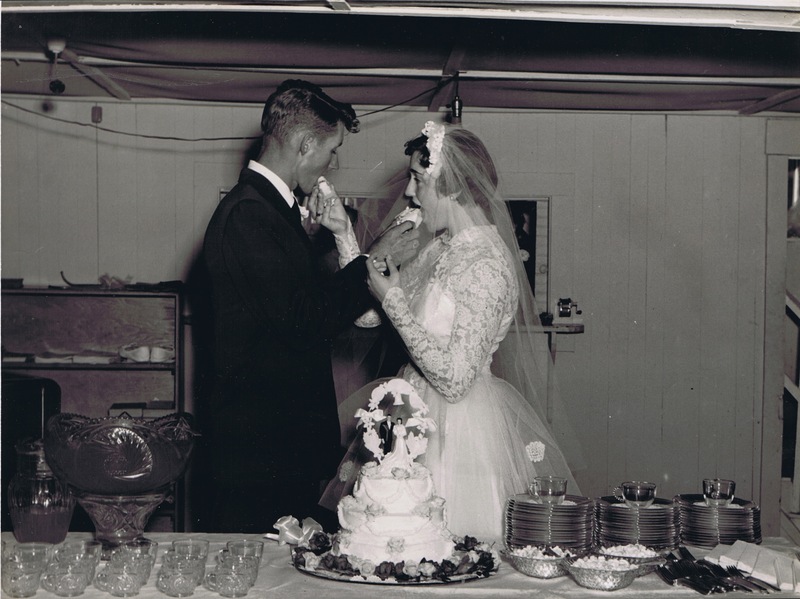 Patti Pagliai, of College Mound, sister of the bridegroom, and Beverly House, of Kansas City, cousin of the bride, as flower girls were dressed in frocks of net and taffeta of pink and green respectively. Jerry Lamonaco, of Kansas City, cousin of the bride, was ring bearer. Damon Pagliai, of College Mound, served his brother as best man and Donald Hyde, brother of the bride, Don Wisdom, Bob Jones and Leroy Binder, all of Callao, were ushers. All wore business suits and white carnation boutonnieres. Mrs. Hyde chose for her daughter’s wedding a navy blue tailored suit with which she wore a corsage arrangement of red carnations. Mrs. Pagliai wore a light blue suit with a pink carnation corsage. Immediately following the ceremony the bride’s parents entertained at a reception in the basement of the church where guests were served refreshments of cake, punch and mints. 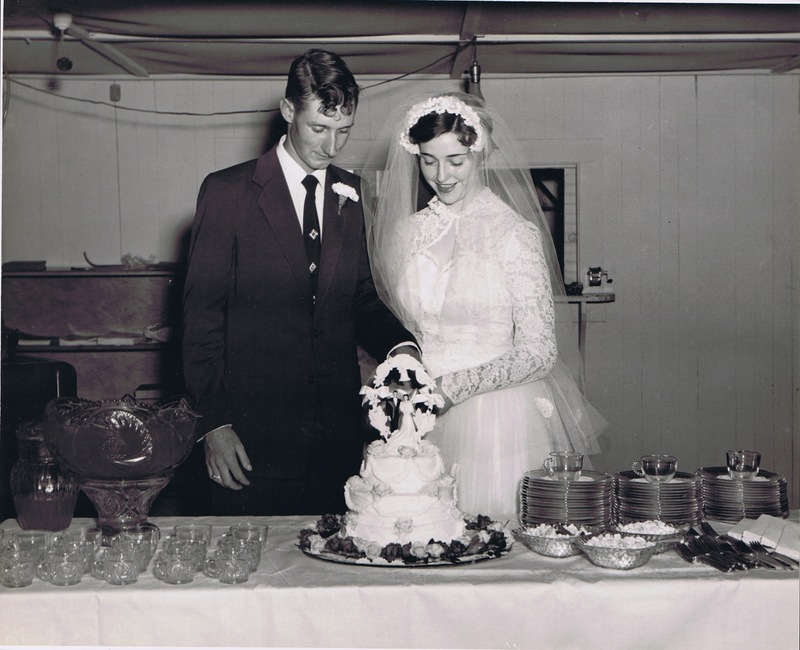 The three tiered decorated wedding cake was baked by the bride’s aunt, Mrs. Roy Spencer. Mrs. Spencer was assisted in serving by the Misses Anita Frazier, Charlotte Wisdom and Opal Smith. 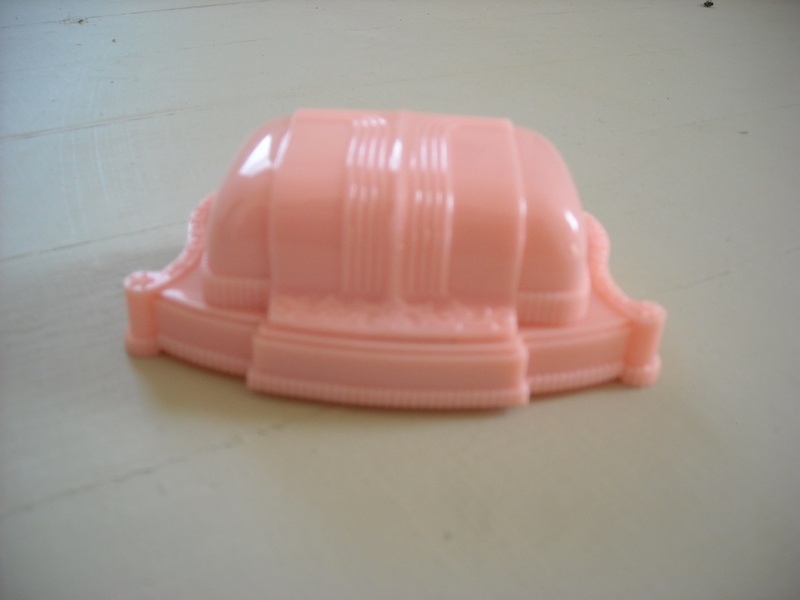 All wore street dresses with white carnation corsages. 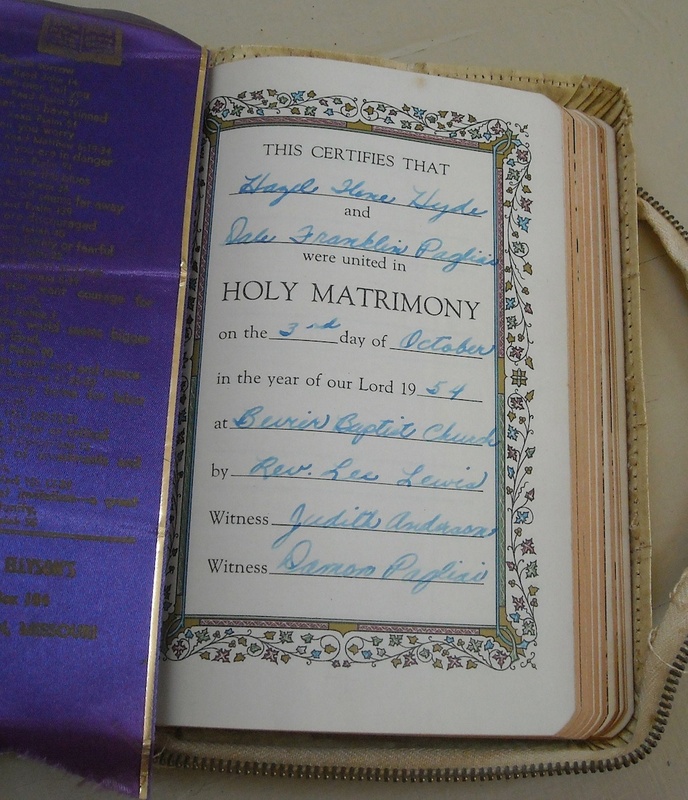 Miss Carol Milburn, cousin of the bridegroom, was in charge of the guest book. She wore a ballerina length dress of pink lace and net. For traveling Mrs. Pagliai wore a brown tweed suit with brown accessories and a white carnation corsage. After a short wedding trip the couple will be at home in College Mound where the bridegroom is engaged in farming. The bride graduated from Callao High School last spring while Mr. Pagliai is a graduate of Macon High School with the class of 1952. Guests from a distance who attended the wedding were: Mr. and Mrs. J. W. Dutcher, Pueblo, Colo., Mr. and Mrs. G. A. House, Mrs. Neva Hyde, Mrs. Ethel Haan, Mrs. Michael Lomanaco, all of Kansas City, Mr. and Mrs. J. W. Winkler and son, and Cordelia Winkler, of Huntsville, and Carl Britt, of Tulsa, Okla. So there you have it — very simple, very sweet. Most of the girls in the wedding either used dresses they already owned, or borrowed dresses from friends, to wear in the wedding. Hazel made Patti’s dress, and she also made her own traveling suit. I’ve got some more things to show you from the wedding over the next few days, so I hope you’ll visit again! Immediately following the marriage ceremony, the reception was held in the church basement. The beautiful cake was baked and decorated by Hazel’s Aunt Ruby, who also served the cake at the reception with the assistance of Hazel’s friends Anita Frazier, Charlotte Wisdom, and Opal Smith. The entire reception menu was very simple: cake, punch, and mints. There were no fancy decorations, just the beautifully set table. Crude light bulb fixture hanging from the ceiling, pencil sharpener on the wall behind them. And notice in the bookcase to the left — there’s a pair of slippers on the shelf!